ARGH! It is 6.35am and I have to leave the house in five minutes to catch a train to Rugby where I am taking part in the first ever Warwickshire Year Nine book of the year award, and I've just realised that the post I should have posted last night never got written. ARGH! SORRY! 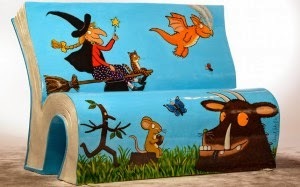 So, briefly what I was going to say is this: HURRAY for the National Literacy Trust which filled London with beautiful benches this summer all painted to illustrate popular books for adults and children. People walked from one to another, took pictures and generally celebrated books, authors and London too. Last night an auction was held to sell off the benches which raised thousands for literacy projects. But the project doesn't stop there. Thanks to funding from the Mayor of London, the NLT is working with hundreds of London schools on encouraging reading for pleasure, working with kids on London-set books and even providing them with the materials to create a bench of their own. My book When I Was Joe is one of the books chosen for the scheme, and last week I spoke to a room full of teachers to brief them about it. They were great, and so were the organisers, and I'm very proud and excited to be part of this wonderful project. What's more I met them at Hackney Pirates which is an amazing bookshop/cafe where volunteers help kids after school with creative or educational programmes. That's it! Got to get to Euston! Sorry! Well done - great projects - wonderful benches - now start breathing again! Great news Keren! Congratulations on your bench... at the risk of being facetious... you've made your bench mark on the literary world! Wonderful! Hope you caught the train! Don't worry about the shortness of the blog. Sometimes the long blogs are really daunting to read... I was a major culprit last week! So short and to the point is great to break it all up. Good to know there's a happy London ending for the London benches. A fine, fast post. Keren!